Exporter of a wide range of products which include rotary kiln incinerator (dry scrubbing technology ) and rotary kiln incinerator (wet scrubbing technology). · Primary Rotating Chamber (keeps rotating at a low speed to ensure excellent quality of incineration). · Rotary incinerator equipped with feeder bucket elevator/ram feeder and conveyor for continuous waste feeding. · Material of Construction – Heavy duty steel with higher thickness used in kiln and structures fabrication for extremely long life. Material of Construction – Heavy duty steel with higher thickness used in kiln and structures fabrication for extremely long life. 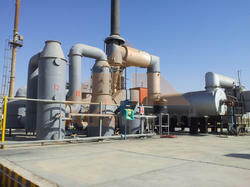 Various types of Air Pollution Control Devices (Quencher, Venturi Scrubber, Packed Bed Scrubber, 2 stage scrubber etc).